Roger Federer, one of the top tennis player in the world won his first singles title of the year 2012 by winning ABN AMRO World Tennis Tournament. He defeated Martin Juan del Potro in the final. For more about this tournament, read the following articles. 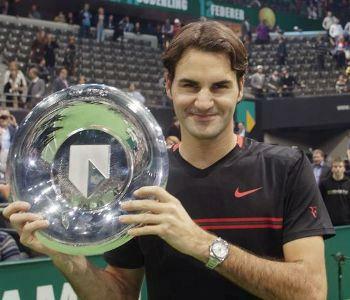 Roger Federer won his first singles title of the year at 2012 ABN AMRO World Tennis Tournament. He defeated Juan Martin del Potro of Argentina in the final of the tournament by 6-1,6-4 in straight sets. The doubles title came to the pair of Michael Llodra and Nenad Zimonzic who defeated the pair of Robert Lindstedt & Horia Tecau. ABN AMRO World Tennis Tournament is a ATP World Tour 500 series tournament. World No. 3 and winner of sixteen Grand Slams tournaments, Roger Fedrer was top seeded for the tournament in singles event. Tomas Berdych of Czech Republic was seeded second. In the final held at Ahoy Rotterdam indoor sporting arena, Rotterdam (Netherlands) Roger Federer defeated Juan Martin del Potro easily. Federer was in top of his game giving no chance to the opposition. Through his journey he defeated Nikolay Devidenko in the semi-final, Narkko Nieminen in the quarter-final, Nicolas Mahut in the first round. In the doubles event Llodra and Zimonjic beats Lindstedt and Tecau in a tough final by 4-6,7-5,16-14. The winning pair was second seeded for the tournament.